World War I economy efforts produced some of the most unusual and highly sought after issues of the 20th century. The use of the Rotary Press in producing coil issues greatly enhanced the quality of the stamps and resulted in more effi cient production methods. Coil issues were fi rst produced in this manner in 1914. Sometime in early 1919 the Bureau of Engraving and Printing came under pressure from the White House to cut costs wherever they could. The war had cost the nation more money than anyone had anticipated. To comply with this directive, the Bureau attempted to make use of 170 subject coil sheets that had been produced five years earlier and had laid dormant, awaiting destruction as production over-runs. This group of sheets had already received the vertical perforation 10, as was typical of the Rotary Press coil issues. The Rotary Press enabled the Bureau to print, gum, perforate and package the coils into rolls of up to 1,000 stamps without any manual effort. At times, two or more sheets remained on the press roll. This is the so-called “waste” which had been set aside and which the Bureau now saw fi t to use in order to comply with the government mandate to economize wherever and whenever possible. Normally these sheets would have been incinerated. Since these sheets had already received their vertical perforations, it was not a difficult task to send them to the individual perforators to receive their horizontal companions. The Flat Plate perforation 11 was employed and thus we have the very unusual perforation 11 x 10 variety on Rotary Press sheet stamps. Up until that time, the Rotary Press had been used solely for coil stamps. To make matters even more perplexing, they were issued in their original sheet configuration of 170 subjects; 17 vertical rows by 10 rows horizontal. Ever on the lookout for any new varieties, collectors soon discovered this new stamp used on letters and demanded that the stamps be placed on sale at the Philatelic Sales Division in Washington. The request was honored and shortly thereafter the stamps were placed. But, collectors had discovered that there were three different types of upper sheet margins. The first omitted the top row of horizontal perforations. Another had the horizontal perforations at the top, but the vertical perforations ended at the edge of the design and did not extend into the margins. The third was similar to the second except that the vertical perforations extended to the very edge of the sheet. Again collectors clamored to have all three types made available to them. The Sales Division did its best to comply with their wishes. A special order was placed with the Bureau for sheets of the 1¢ and 2¢ “imperforate horizontally at the top”. The Bureau promptly misinterpreted the order and proceeded to supply a quantity of sheets of each denomination completely devoid of any horizontal perforations. Strangely enough, the Sales Division did not notice this mistake and the supply of these “errors” were quickly used up in filling the special orders coming in from collectors and dealers. Due to the fact that they went directly into the hands of philatelists, and never entered the commercial marketplace, they are by no means rare today. A major error does exist though on the 2¢ Type III (Scott 540b). There are 25 pairs known to lack the vertical perforations. Another rare stamp is Scott 539, the 2¢ coil waste issue from Type II plates. Only a very small quantity of these is known and they will command prices at or above the Scott Catalogue listing whenever they change hands. Be careful though of altered Type III stamps to resemble this rarity. Take a good look at the shading lines in the ribbons for any evidence of scraping. The genuine Type II’s have one shading line in each of the ribbons. A type III has two shading lines. A 20-power magnifi cation can usually spot this nefarious action. The best advice though is to insist on a certifi cate from one of the leading expert committees as a condition of purchase. There were three denominations involved with the coil waste issue; 1¢, 2¢ and 3¢, these being identified by their Scott Catalogue numbers 538 through 541, which includes both design types of the 2¢ variety. These stamps are seldom found with centering above fine. Expect to pay a nice premium for grades of very fine and better. We have not seen any production figures for these stamps and it is unlikely that any records were kept at the Bureau. It is generally agreed among experts that, excepting the Scott 539, quantities issued range from two to three million each. 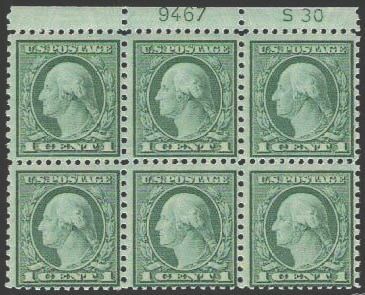 On the rare 2¢ Type II it is estimated that as few as 20 sheets, or 3,400 stamps were given this unusual 11 x 10 perforation. During the spring of 1921 the Bureau once again made use of coil waste sheets. There is one major difference though between these and the ones we just spoke about. These sheets had never received their vertical perforations and were perforated instead by the Flat Plate Press as perforation gauge 11 in both directions. When compared to the previous issue, these 1¢ and 2¢ stamps (Scott #’s 545 and 546) are many times scarcer. Even though it is generally agreed that the quantities issued were similar, it took much longer for collectors to discover their existence and thus fewer examples survived. At the time, they were mistaken for their then normal Flat Plate perforated 11 regular issues (Scott #’s 498 and 499). The distinguishing characteristic of Rotary versus Flat Plate printed stamps is in the design measurement of the stamp. The stamp paper is stretched in the direction of the curvature of the press. In the case of the Rotary Press, the design is approximately one millimeter (1mm) greater in width than the Flat Plate Press. On the Flat Press the design is stretched vertically, which results in a taller but narrower design. As with their 1919 coil waste counterparts, centering is extremely poor. Expect to pay a huge premium if a very fine example is found. If you find one of these on a non-philatelic cover, which is on ordinary letter not to or from a philatelist, you have found a valuable item worthy of inclusion in any top-notch specialized collection. Coil waste issues, even today, sell for a fraction of their true worth. This is in all likelihood due to lack of full scale publicity and lack of demand. It is also safe to say that many collectors are either unknowing of their existence or unaware of their fascinating story. A final caveat is in order. If seeking a postally used example, make certain that the cancel is contemporaneous. A certificate of authenticity is suggested.